On paper a day for a breakaway again, on tarmac there’s a chance for surprises in the finish. Tomorrow’s summit finish will weigh on the mind for the GC contenders but for the others there’s the stage win. Stage 11 Review: the longest stage in the race and full-on racing from start to finish. Typically you can enjoy Vuelta tapas style with bite-sized viewing of the final 30-10 minutes but this time the stage had a wild start and it stayed lively to the end. They covered 49km in the first hour and that included a 3rd category climb and Miguel Angel Lopez was left trailing and had to chase for a long time. Finally when a move did go clear for good it contained Thibaut Pinot, still a GC contender and you can imagine the frustration felt by the others, finally they had made a move only to find it was going to be chased down because it contained a threat to the GC ambitions of Movistar, Mitchelton-Scott and the others. Only there was a poker bluff in the peloton for a while until Movistar folded and took up the chase which allowed the 19 rider move to go clear. Pinot was himself very active, possibly too much but so was everyone else with waves of attacks. Finally Alessandro de Marchi (BMC Racing) got clear with Jhonatan Restrepo (Katusha) and the pair formed an awkward tandem as Restrepo is a fast finisher. De Marchi tried to get clear and on the final metres of the final climb of the day he broke Restrepo, leg-pressing a huge gear to go solo for the stage win. It’s only his fourth career win, and his third stage win in the Vuelta. 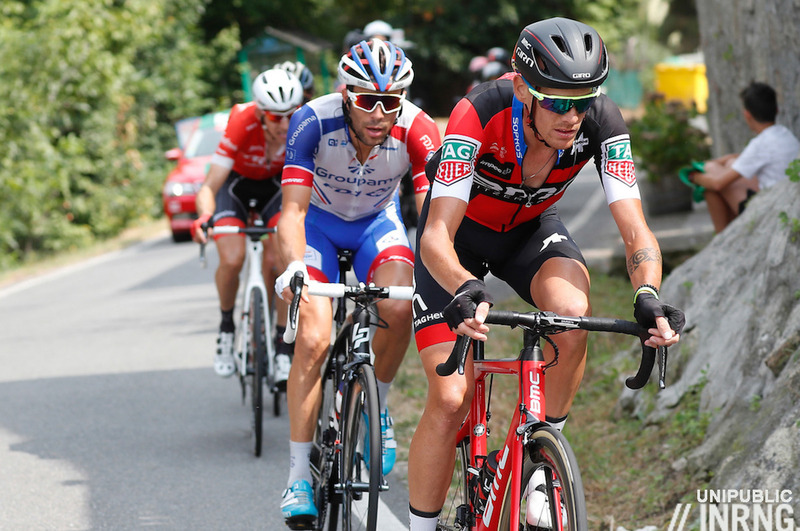 Pinot only gained 12 seconds on the day but might have stirred up things between Movistar and Mitchelton-Scott. The Route: 181km and a trip to the Punta de Estaca de Bares, Spain’s northernmost point with the finish by the lighthouse on the cape. After 40km the race reaches the coast and there are several short, sharp climbs and it’s exposed although the weather forecast predicts quiet 10-20km/h onshore breeze. The day’s main ascent is above San Pedro, 7km at 5% and all on a narrow road followed by a fast descent and then more climbing before reaching the sprint in Ortigueira and then a quick loop south via a climb and some wooded roads before returning to reach the cape. It’s all on twisty roads that aren’t suited to big sprint trains, it’s more like a early season semi-classic. The Contenders: breakaway or sprint? The early breakaway can go clear but there’s a good chance that a move forms late in today’s stage and slips away for the win. With a big summit finish tomorrow plenty of riders will hope for a rest day although of course some will be anticipating this and will aim for today because tomorrow doesn’t suit. Punchy riders with good race craft like Michał Kwiatkowski (Team Sky), Omar Fraile (Astana), Enric Mas (Quick Step), Tony Gallopin (Ag2r La Mondiale) and Gorka Izaguirre (Bahrain-Merida) come to mind for a late escape, while Ivan Cortina Garcia (Bahrain-Merida) is almost a local and Simon Clarke (EF-Drapac) is hunting for a second stage win and could try the early move. We can list more names, the point is this is an open stage. Otherwise Quick Step will try to keep a lid on it all and set up Elia Viviani for the win, made easier because Nacer Bouhanni has quit the race. Peter Sagan should be the prototype winner today but hasn’t looked convincing. Weather: a cool 19°C and cloudy with showers forecast. Tune in: the finish is forecast for 5.10pm CEST. Interested to see Mas rate a mention. He’s ridden a la Zubeldia to the brink of the top 10 and was clinging onto the GC group yesterday. Is he going to excel in the forthcoming mountain stages? Is he a chance of a podium in what seems an open Vuelta? I’m going with a ‘no’ on Mas. 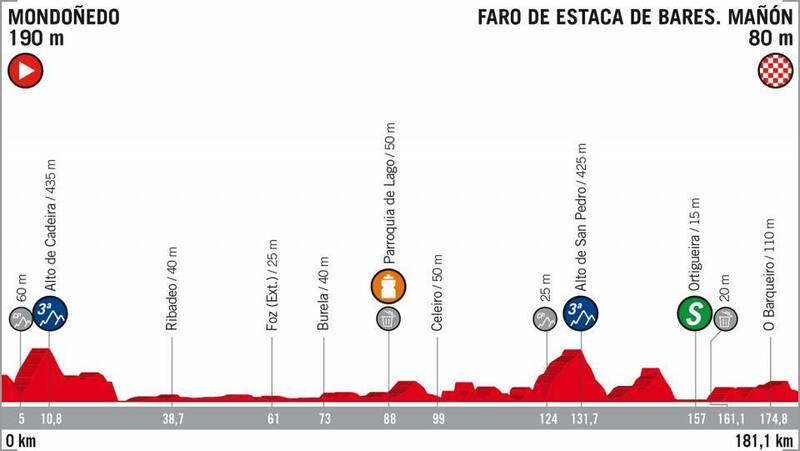 The shakedown has yet to happen in this Vuelta and when it does the top ten will look quite different. Never putting Nacer Bouhanni in my fantasy cycling team again. Not to be trusted. Rigoberto “hands of stone (D)Uran perhaps? +1 for that. +1 for that. The next three days should sort the wheat from the chaff though. That Bouhanni must have sustained a terrible crash somewhere?? Tyler Hamilton, Lawson Craddock, and quite a few managed to survive. (Please excuse my less sympathy expression) Greipel as I recall always climb like a fearless undefeated roaring lion despite his heavy legs grinding up. What about Pöstlberger? He’s tried a late surge for the meta before. Shhhh. The odds are already shorter than they should be. Can you actually make money betting on cycling? Surely you’d have to be a wizard to do so – with over 150 different potential winners. I only bet very small sums for fun (usually 1€ on a rider) but you don’t have to be a wizard. Basically I started doing so because I was always claiming to know who’d do well on certain stage or race and felt like I had to walk the walk when talking the talk. De Marchi yesterday was not so hard, he’d been in a break before where he lasted long, he’s won similar stages in the Vuelta, the team have no GC guy to protect, the finish was flat-ish but with a final climb before where he could depose of any rivals by sheer power, and similar riders like De Gendt, Benoot, Cummings are not in top form so there you go: a very educated guess. Winning a cycling race is very freaking hard to do and basically everyday there’s only a handful of true contenders even if a hundred fifty take the start. Around 5 or 6 years ago, some friends and I were in the pub on Grand National day which was the day before Paris Roubaix. I’m not a betting man, but had a hunch about Spartacus and while my friends laid money on the gee gees, I enquired about a bet on the swift Swiss. Gutted to be told that they didn’t have enough info to be able to lay my bet and needless to say fab Fab won the next day…. Meanwhile my mate won a grand on the horses and treated us to just a few drinks so not a bad weekend all in all.. Thanks again INRNG, almost posted yesterday to ask what of Benoot’s chances? I resisted due to not hearing much of him throughout the race and hence assumed he might still be recovering. In the mix again today perhaps, or is De Gendt the man for Lotto? Yesterday’s stage was one of the most exciting to watch this year – one of my top 5 days of 2018 I think. Up there with that Giro stage, and the finale of La Course. Paris Roubaix possibly too, and I’ll leave number 5 open, given there are still a few weeks to go! I was quite surprised that De Marchi has only had four victories – to me he’s a rider with a greater reputation than that! I was also surprised by DeMarchi’s lack of wins – perhaps an indication of how rarely the break succeeds in general, as he is a regular in the break and usually looks strong. Not to take anything away from the win as he was obviously a strong and well deserved winner but theres a huge element of being in the right place at the right time here, in the end the peleton was ragged and they had to let a move go even it no everyone was 100% happy with it, just so happened that move was one with 3 BMC riders in there had been plenty of other combinations of riders in previous moves that came to nothing. A very nice day of racing! FDJ gave a lot with not much to show for it in the end. But I love, that there still are teams in the wt, that don‘t act like corporations (sunweb with their rigid system comes to mind), but let their riders have some fun and take their chances, even if this means, that it doesn‘t work out all the time. In the L‘Equipe was a nice interview with the roommates Molard and Pinot and in it was a wonderful, joyous picture of the two laughing. Maybe, hopefully, this fun translates into a stagewin. I’m thinking QS might pull a Mitchelton today: put Dries Devenyns in the break and let Bora, Movistar, Mitchelton do the work. If it all comes back together they can still try to set up Viviani. Though it looks like Mitchelton-Scott are very reluctant leaders (when was there a grumpier GC leader than Simon Yates?) and intend to do as little as decently possible to fulfill their obligations. The Chuckle Brothers “to me, to you” scenario with Movistar for the race leadership is fabulous, the narrative the race has been missing. The unfortunate aspect is that it’s slightly comedic / farcical!!!! Just a point about yesterday’s stage and a point I made other day about roadbook, heard that roadbook had yesterday’s stage without 2000m of elevation – it turned out to be great day of racing and a lot tougher especially with explosive start and showed how hard they were racing by finishing about 40 minutes ahead of schedule, anyway some riders showing the elevation gained was over 50% higher than stated!! Now I know GPS units can get this wrong but I would expect pro riders to have units with barometers. I assume most teams will plot the route themselves to get accurate view of elevation for each stage or would they only potentially do this for key stages? As having 50% more elevation than stated is a big difference in terms of effort. So as INRNG stated it must be deliberate especially with that level of difference. On the Michelton Scott Backstage pass video they said they’d measured it and got 3600m ascent (I think) amd they have intimated throughout that their pre-measured data has been exceeding the road book figures. (I think MS use Veloviewer). Anyway going to give the INRNG casquette a showing at the ToB for the next couple of days. Barometers are less accurate than GPS as they depend upon pressure which changes with temperature. I used to have a HR monitor with barametric alt, I’d ride a loop only to find I’d finished at a different altitude to when I started. Both systems have their problems but either way the Vuelta’s supplied numbers are way off, even using a cheap barometer and driving the course during the approach or departure of a storm shouldn’t deliver such odd numbers. Maybe the quoted figures in the roadbook are actually something else even if it’s not defined. But several other things are off too, like the percentages for the climbs. As someone who has spent a lot of time doing this over the past few decades I can attest to wide variations in these types of measurements. BITD we had little more than the trip-meter in the rental car combined with an altimeter, but no matter how we created this data, a client would often ride the exact same course and say their distance/elevation gain/gradients were different. We’d usually correct ours using their data only to find the next time we’d ride this route a client would come up with different values. Eventually we’d end up with a sort of average value and say we understand that “your mileage may vary”. The problem with GPS is that it relies on triangulation and the mountainous countryside around you often blocks that from happening. If you’ve ever cycled much in the mountains you’ll sometimes find yourself ‘riding’ different roads because a satellite signal drops out. That’s less likely to happen closer to a peak, but that’s why Garmin have a correction facility which tries to even it out from lots of readings. Barometers are subject to pressure changes with weather – if you’ve ever stopped on a windy day you’ll find that when you restart your altitude will alter drastically even though you’ve moved nowhere. I always give my altimeter a good deal of latitude (which is a turn of phrase that mariners had for inaccuracies they suffered in calculating their position) so that I don’t get my hopes up on topping out when the reality is different. I hope today is a good day for my countryman Cortina. I know the area well, since O Barqueiro is my father’s town. After the first pass through O Barqueiro, they head south along the CP-4401 road (acceptable asphalt and acceptable width, with two lanes of traffic) to climb the Alto de San Pedro, then turn right onto CP-4402 and shortly after to the left by CP-6111, until you reach C-101 that goes down to Ortigueira. This section by CP-4402 and CP-6111 (between CP-4401 and C-101) is narrow road, with abundant trees and very twisty and with rough asphalt, which if it rains can be quite slippery. And the CP-6111 (after Couzadoiro) has an irregular rise section. From Origueira to the second pass through O Barqueiro to turn off towards Estaca de Bares they go along the AC-862 road, very wide and well paved, but it goes up and down continuously. Very difficult terrain for the sprinters and for their teams to control the race. I would not bet today for them. I have made a screenshot in google maps to visualize this part of the route that I describe but I do not know if you can add images in the comments. Sidenote: northwest Spain is really beautiful, isn’t it? Every year the Vuelta goes there, I’m impressed by the vistas. Craziness at the finish. First an odd pinch point just meters before the finish, where it looked like the crowd had pushed the barriers out into the course. Ganiez came over towards it slightly just as van Baarle was trying to come beside him, and you can see van Baarle stop pedaling for a split second. I don’t think it affected the finish order, but could have been a disaster if more riders were sprinting. And then disaster did happen right after the finish, with photographers taking away over half of the narrow road, and a chucklehead running into the narrow gap with his head turned away from the riders. Ganiez slammed into him, and van Baarle crashed hard over the flying fool. Apparently he had to be carried away from the scene. You could see this mess unfolding on the replay – why did this jerk have to run in front of the riders? He couldn’t have waited for them to pass? Of course one could wonder why they let the photogs block up so much of the road so close to the finish line in the first place? As someone once said, “this ain’t rocket surgery” as race finish logistics are pretty straightforward…so why is this f–ked up so often? Just watched the highlights. It was where I thought it was. Narrow at the end like I said. No room for a bunch sprint. Spectacular place but a bit of a strange choice for a stage finish. Noted team buses parked way down the road.